Help very young children explore their world and discover God's love for them with these first words with God. This colourful and sturdy padded board book teaches children the importance of knowing God. Illustrated with bright cheerful pictures of everyday scenes that children can relate to and one simple sentence per page. Other titles in the series: Please, Thank you, Sorry, God Knows Me, God Loves Me. Juliet David has written many children's stories and Bible activity books. Her other interests include painting, music, and travel to Israel and other Bible lands. This experienced author lives in London with her family. Some her children's books include The Stories Jesus Told series, Candle Bible for Toddlers series, and Moving Windows Bible Stories. 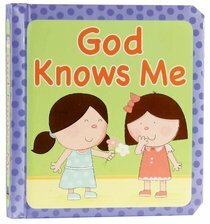 Customer Reviews For "God Knows Me"
This book is a durable board book for toddlers. It talks about how God knows us really well in various situations. It is a book that reassures our children that God is looking after us and knows everything about us. Simple language appropriate for children.